The wild, wild west, and also pasta. A typical gun-slinging inhabitant of 1900s western movies. The Spaghetti Westerner started off as a Hero, riding into town to see off the bad guys, saving any pretty women and cute kids that happened to be in the neighbourhood. 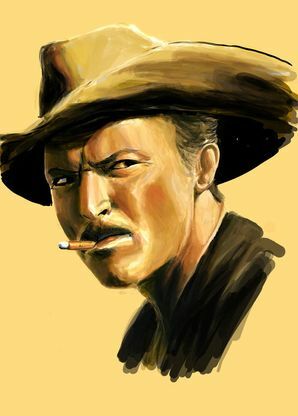 You would think that this would make the Spaghetti Westerner popular, if not the life and soul of the party, but the truth is that people were always a little scared of him. His unapproachable manner and usual lack of humour and liking for a few dollars more meant that as often as not, he was left to ride into the sunset alone. Over time, his loner persona and lack of faith in humanity in general turned into real bitterness and before he or anyone else realized it, he had gone over to the Dark Side, turning on other Heroes and becoming a certified Monster. Now, he wanders the Badlands looking for Heroes to kill, and if business is slow, he occasionally raids into the Slightly Better Lands, where he makes a thorough nuisance of himself. Quick to anger, he is even quicker on the draw and almost impossible to defeat at long range. Close in, the Hero will find that he is as tough as old boots and smells even worse, due to the foul cigars he insists on smoking at all times and the fact that he only appears to bathe about once a month, if that.